If that weren’t enough to send you into a dizzying spiral of nostalgia, just recall Richie’s guest list–it contained everyone from our queen of squandered talent Lindsay Lohan and of course, Mischa Barton. Remember her? Barely? Me too. This might jog your memory: The O.C. starlet was rushed to the hospital during Richie’s shindig–not due to a drug overdose–but a fateful combination of antibiotics and booze. Sure. Yes, I know, dearest Filthy Dreams readers, those sure were the good old days. *Sigh* It was the halcyon era of gossip–years of slack-jawed car rides and stumbling out of clubs. From the numerous DUI arrests of Paris Hilton, Nicole Richie and Lindsay Lohan to Britney Spears’s ongoing hair-shaving, umbrella-wielding, barefoot in the gas station fiascos, it was the height of celebrity trash in the new millennium. 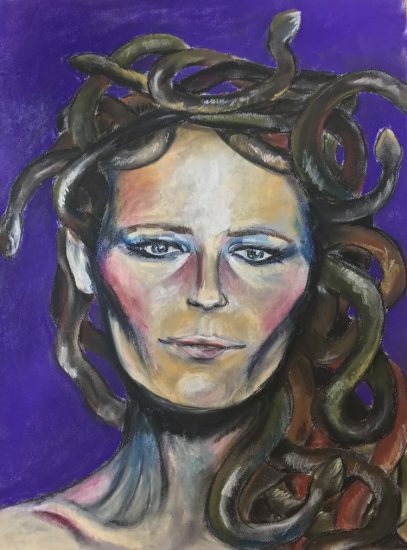 Luckily, a current exhibition titled after Richie’s Memorial Day bash gives viewers the opportunity to reminisce about starlets acting badly and the copious gossip mags and blogs that followed them. Held at the THNK1994 Museum (so named for the Tonya Harding/Nancy Kerrigan scandal in 1994, which is the subject of the museum’s permanent collection. I was always Team Tonya. White trash for the win! ), Nicole Richie’s 2007 Memorial Day BBQ revives this thoroughly tacky, gloriously gaudy era of the mid-2000s, celebrating the times of giant sunglasses, tiny dogs, and naturally, the go-to outfit of Juicy Couture tracksuits and Ugg boots. The museum, run by Viviana Rosales Olen and Matt Harkins, collaborated and co-curated the show with famed Instagram account @popculturediedin2009, which, as a connoisseur of all things trash, I follow religiously. 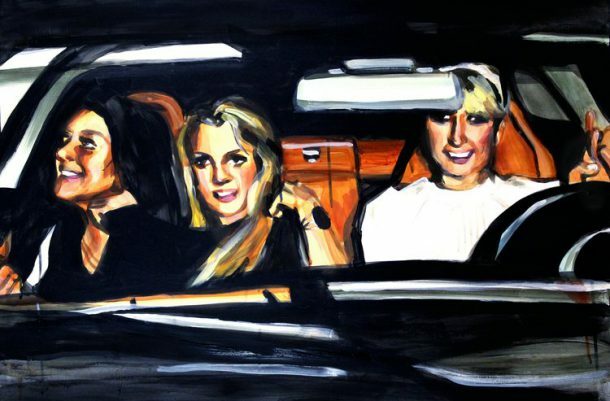 Appearing as if it was ripped from the pages of US Weekly or Star, the exhibition surrounds viewers with familiar faces from Naomi Campbell to Anna Nicole Smith to Winona Ryder after her shoplifting excursion to the goddesses of gossip–Paris, Britney, Nicole and Lindsay. 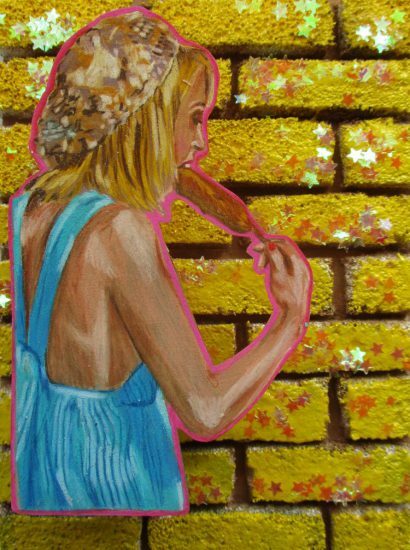 On one wall, Nicole Richie downs a giant corndog in a mixed media collage by MaVa while Lindsay Lohan flashes a peace sign in a bikini while sporting her fashion-forward alcohol monitoring ankle bracelet in a painting by Laura Collins. 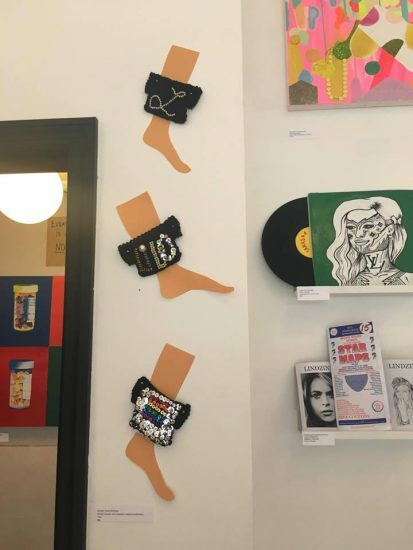 Nearby, Tiny Stitchers provides a series of three Knitted Ankle Monitors in case you want to put your monitor in a cozy emblazoned with LiLo in honor of our rehab role model. Not all the work was figural, however. 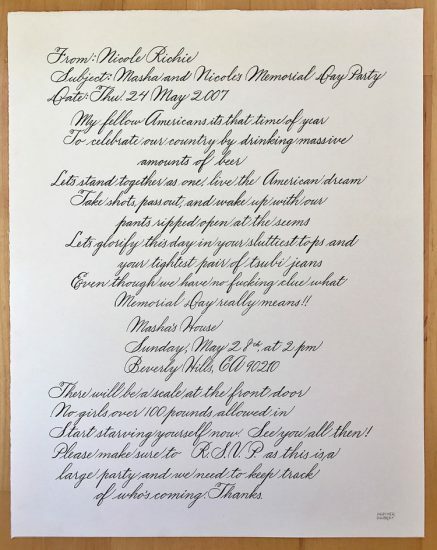 Heather Rohnert transformed Nicole Richie’s Memorial Day invite, as well as her nonchalant explanation for Mischa’s emergency (“She’s good. She just mixed antibiotics and alcohol and got sick.) into chic and even, classy calligraphy. 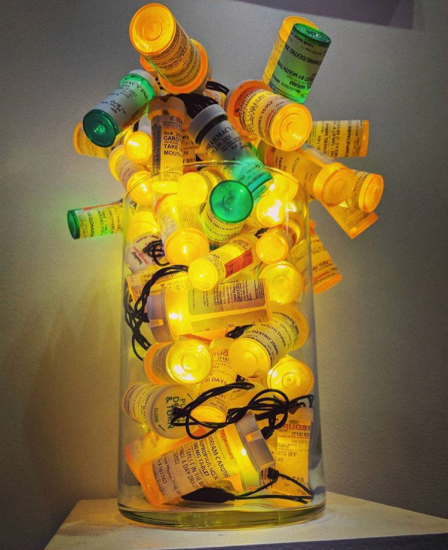 And for those who need some sculptural home décor, Miriam Carothers created a glow sculpture from a collection of Adderall bottles, the prescribed favorite of all those drugged-up, speed-hungry divas. 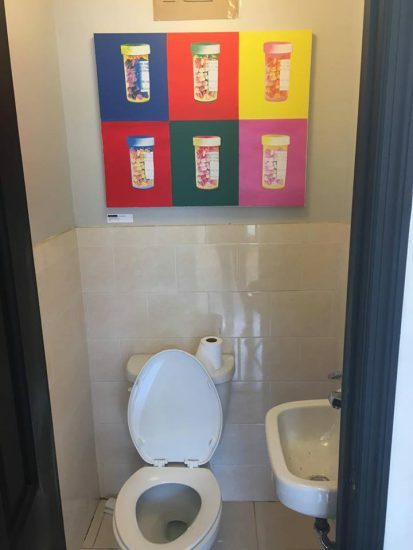 There’s even a Warholian serial painting of Paris Hilton’s Valtrex prescription bottle, hung tastefully in the Crown Heights-based museum’s bathroom. In addition to the artworks, the show also presents binders chock full of clippings from sleazy gossip rags, as well as the starlets’ occasional gestures at cleaning up their act in more respectable magazines like Vanity Fair or Elle. In true archival form, each binder is organized by individual celebrity, documenting their rise and copious falls. Choosing the Lindsay Lohan binder, I relived her torrid affair with Sam Ronson and a forgotten but undeniably fantastic photo of Lindsay with the inside of her nose caked in coke. Naughty! It was an archival trip down memory lane. Overall, the show revels in trash and thank god! Someone had to! Who can stop themselves from reminiscing about eating up the excess of hotel heiresses, Hollywood stars and burnt-out child actresses who proved that you don’t have to be poor to be classless? They flashed their vaginas, drank vodka out of water bottles, and went in and out of rehab. It was a flurry of misbehavior worthy of only awe, envy and fascination. Beyond all the nostalgic fun, Nicole Richie’s 2007 Memorial Day BBQ did make me take a not-so-serious pause to consider the attraction to all this trash. Why do I have a nagging nostalgia for only ten years earlier? Granted, pouring over gossip blogs was a major hobby of mine in college. However, obviously with the popularity of @popculturediedin2009, I’m not alone. In some respects, the gossip fodder of the mid-2000s seems like it came from a completely different era. It was a perfect storm of the development of online technology, pre-celebrities with multi-person PR teams and progressive PC culture concerned with shaming. Something about it seems almost naïve, in a sense. First and foremost, the influx of gossip at that time is a story of technology, a collision of the continued prominence of print media with the growth of online publishing accessibility. It was a time of Pink is the New Blog, DListed, Perez Hilton before he became insufferable and of course, Oh No They Didn’t!, a Livejournal site, which I am proud to say once posted a Filthy Dreams article. It was the highlight of my career–I should have ended it right then. With both print and blogs, it was a double-whammy of trash, making gossip easily accessible and infectiously, addictively consumable. It was also before the professionalization of celebrity–the Kardashian effect. PR teams now seem to have a handle on how to effectively hide their clients’ substance abuse problems, mental illnesses, sordid affairs and bankruptcies. BORING! And if that sounds harsh, well maybe it’s because it is. As a culture we’ve become more concerned with how we talk about people, even celebrities, and maybe, despite my adoration for laughing about Paris Hilton and Nicole Richie, that’s a good thing. But, this all isn’t to say that this deliciously naughty gossip doesn’t exist today. It does. It’s just in the White House. Rather than teen queens flashing their cooters in the glare of the cameras, we have Trump’s daily Twitter dumps, the Mooch’s curse-laden ramblings, Stephen Miller’s dead-eyed banter and Sean Spicer’s gum-chewing, bush-hiding, Easter bunny adoration. In the 2000s, celebrity dish was a way to escape from the war zone of the Bush years when we didn’t know what a crumbling country really looked like. Today, though, that reality show-esque entertainment is coming from the administration–Trump really is, as he boasts, a “ratings machine.” And sure, maybe there aren’t as many women behaving badly as in the 2000s, but well, we’ll always have Kellyanne. Tags: @popculturediedin2009, Anna Nicole Smith, Britney Spears, Brittany Boynton, Derek Covington Smith, Heather Rohnert, Jen Jackson, Laura Collins, Lila Freeman, Lindsay Montgomery, Miriam Carothers, Mischa Barton, Natasha Winter Best, Nick Walsh, Nicole Richie, Nicole Richie's 2007 Memorial Day BBQ, Paris Hilton, Pop Aesthete, Randy Glance, Rosa Escandon, Sarah Fris, The MaVa, The THNK1994 Museum, THNK1994, Tiny Stitchers, Valerie Petrov, Viviana Rosales Olen, Winona Ryder. Bookmark the permalink.